By Kori ~ July 16th, 2012. Ryan and Renee Crane own Kerloo Cellars, located in Walla Walla, Washington. The Cranes relocated from Seattle to Walla Walla to pursue their winemaking dream. 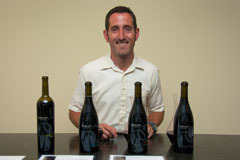 Shortly after moving to Walla Walla, Ryan earned an AAAS in Enology and Viticulture from Walla Walla Community College. He gained experience working crush under Marie-Eve Gilla at Forgeron Cellars and then served as assistant winemaker at Va Piano for three years before focusing his efforts solely on building Kerloo. His experience and contacts in the industry have helped him secure some prized vineyard sources and to hit the ground running with his own winery. Incidentally, Kerloo describes the call of the whooping crane. On a recent visit to Walla Walla, we visited the Kerloo tasting room downtown, which has been open about a year. We had the pleasure to meet Ryan Crane and taste through some of Kerlooâ€™s current and upcoming releases. We have been impressed with his wines in the past but were glad to have the opportunity to visit with him and taste his 2010 wines, which will hit the Seattle market on August 1st. We thought all four of the 2010â€™s were very good but were especially impressed with the Les Collines Syrah and the Alder Ridge Grenache. Both are outstanding! Kerlooâ€™s current production level for the 2010 vintage is 950 cases. They have about 1,300 cases in barrel for the 2011 vintage and anticipate increasing to around 1,800 cases with the 2012 vintage. While the tasting room is located on 2nd Avenue in downtown Walla Walla, Ryan Crane produces his wines at the Va Piano facility south of town. His goal is to have his own facility for Kerloo by 2014. As we have said before, Kerloo Cellars is definitely a winery to watch. Be sure to be on the lookout for their 2010â€™s which should be hitting store shelves soon. And if you are in the Walla Walla area, I highly encourage you to take the time to visit the Kerloo tasting room. 2010 Kerloo Cellars Les Collines Syrah (Les Collines Vineyard, Walla Walla Valley, Washington): 100% Syrah. Deep, dark purple. Gorgeous nose with blackberry, blueberry, and game aromas. Blackberry, blueberry, and bacon come through on the palate. Full-bodied with crisp acidity, and medium to high, smooth tannins. Well-balanced with good complexity and a long, lingering finish. 2010 Kerloo Cellars Alder Ridge Grenache (Alder Ridge Vineyard, Horse Heaven Hills, Washington): 100% Grenache. Deep ruby red. Very aromatic with raspberry, plum, and a touch of tobacco on the nose. More raspberry, plum, and tobacco as well as cinnamon come through on the palate. Medium to full-bodied with crisp acidity and medium tannins. A gorgeous wine with a great mid-palate. Well-balanced with a long finish. 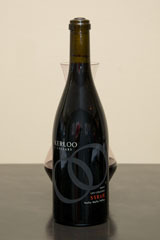 2010 Kerloo Cellars Va Piano Syrah (Va Piano Vineyard, Walla Walla Valley, Washington): 96% Syrah and 4% Viognier. Deep purple red. Beautiful nose with floral notes and red and black fruit aromas. More floral notes as well as bacon and thyme come through on the palate. Medium to full-bodied with lively acidity and smooth tannins. Well-balanced with a long finish. 2010 Kerloo Cellars Tempranillo (Columbia Valley, Washington): 86% Tempranillo and 14% Grenache. Deep red in color. Nice nose with Bing cherry, spice, and floral aromas. Black cherry, Bing cherry, and spice come through on the palate. Medium to full-bodied with crisp acidity, medium tannins, and a long finish.